Camping Rural Presa de Vinuela – what can we say? It was as though we had fallen asleep and woken up in paradise… but only partial paradise you understand. The views, the surroundings, the clean air, the quiet … we really thought we were in a little corner of heaven. The campsite – not so much. We had a decent sized pitch just across the path from a lovely terrace where we could sit with our mouths open looking out over the water. The downside was that the place was rustic. Rustic, we have discovered, is a polite term in camping circles for distinctly run down. We don’t really mind rustic at all. In fact, because we have great facilities on board we are happy with nearby fresh water to fill up with, a waste drop and good electricity. We got all these things at Vinuela and we could relax except for one thing. We had made a true Rookie Mistake when we left “civilisation” to go up into the hills. We didn’t stop at a supermarket or go to a cash machine. In the fridge, we had the ingredients for one dinner and a couple of breakfasts. In the purse, about 18€. We assumed that there would be either a shop nearby or the means to get to one by public transport. Similarly the cash machine. By now, after all these months on the road, we ought to know better. The ‘shop’ on the site had a packet of toilet rolls, a couple of cans of dog food, four ancient ice creams and a tin opener. We were six miles from a cash machine and we only discovered this after manoeuvring the van down a very steep slope, round a hairpin bend and taken fourteen shuffles backwards and forwards to get her on to the pitch. We weren’t getting off again until we absolutely had to. Fortunately for us, there was an additional feature at the camping. They had a really good restaurant and café bar that was open from 9.00 a.m. to 10.00 p.m. and they took cards as payment. Our only challenge, after realising that we had the perfect excuse not to cook for a couple of days, was to make our 18€ last for small orders and tips. The small orders soon went out of the window. We had two meals there that would have satisfied a lumberjack. Walking the dogs was an absolute treat. A small gate, not twenty feet from our pitch, opened on to steps that led to the lakeside and an abundance of interesting paths where the dogs could run free and we could continue our open-mouthed amazement at the beauty of the place. We were only ten miles from Torre del Mar yet we could easily have believed ourselves in Austria. A shepherd walking his flock to the lakeside. Our dogs were not so sure about this at all. It was on such a walk that we met Barry and Margaret, a delightful couple from Cumbria. They told us about a walk they had done up to the village of Los Romeros. The village is only about 2.5 miles away but it is up a very steep incline. Barry and Margaret gave us good advice – just keep putting one foot in front of the other. So, the next morning, after giving the dogs their long morning sprint along the lakeside, we put them in the van and set off up to the village with a rucksack and the promise of a village shop. As I have the Basil Fawlty Award for Stating the Bleeding Obvious I will say it – we were knackered when we got to the top … but it was worth it. The sheer size of the landscape up there is incredible. It is a traditional white Spanish village with a shop, an olive oil factory and a small bar. There is also a nice restaurant, famous apparently for good steaks. Other than that there were wrinkled old ladies sweeping their steps, a couple of old men in flat caps watching us pass, a few friendly dogs out for their morning constitutionals and a kiosk where you can buy a traditional local beer in the afternoon if you so desire. We found the shop and bought a few things but the bill only came to 5€ so we didn’t feel we could use a card to pay. Our small cash kitty was depleting rapidly. Then we went to the village bar to get a drink – water for Shirley, coffee for me – that was another 2€. We were discovering what it’s really like to be on a tight budget. “Large beer?” … and so it went on. We left after devouring a large chocolate ice cream for dessert and coffee. I had chocolate around my mouth like a toddler – it was even up my fingernails. No shame I tell you – we have no shame at all. We returned to the van and watched TV then fell into bed at 8.30 p.m. No stamina either, obviously. We met some lovely people at the site including a nice man called John who made us swear that we wouldn’t name the site on our blog. Sorry John. He stays there for six months or more a year. We also met Dave, another motorhomer who re-ignited our love of Hymer A class motorhomes. One of these is on our wish list. They are such fine machines, built like tanks and with true German efficiency. We agreed with John that this site is best enjoyed with the addition of a hire car, otherwise, with even the best preparation, you would need to move on or take the van out to the shops. On our last evening, we got out the maps and the books to decide on our next stop. We have been very kindly invited by friends Pam and Jeremy to go and stay with them in their house for a few days in the Almeria region. We had two more nights to visit somewhere en route and we decided that we wanted some more spectacular scenery. 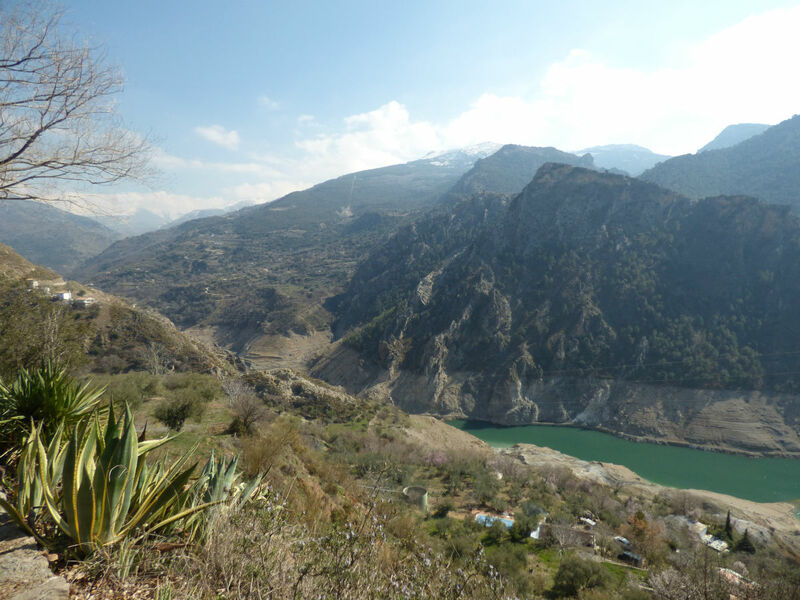 We chose a campsite up in the Sierra Nevada close to the mountain village of Guejar Sierra. The road up there is the narrow, steep drop on one side, true mountain road that no-one in a big vehicle would choose if they had any sense. We stopped on the way at a viewpoint to take a photo and to take deep breaths, letting the long line of traffic behind us go on ahead. We kept passing cyclists and having to choose between a) driving at their speed, b) going around them giving them plenty of room and risking another car coming round one of the hairpin bends and hitting us or c) driving close to the cyclists and risking their safety. We chose a mixture of a) and b) and trembled a lot. Before we left, I looked at the campsite website and could find no GPS coordinates so I put the address given into the satnav. This was yet another Rookie Mistake (lost count now) and it was only when we found ourselves going uphill on a tiny road into the town that we saw the sign that warned “No motorhomes or caravans”. We were committed by then and could do nothing about it. The road seemed to be one way and as we were spat out of a tiny gap into the town square, the awful truth hit us. We couldn’t go anywhere. Balconies and sharp bends on tiny lanes were simply impossible for us. I drove the van into something resembling a space, effectively bunging up the road for everyone while Shirley ran into the Council Offices to ask for help. She came out with a lady and a map. The lady spoke no English but she mimed that we should turn around and go back down the road we had just come up. It seems that it wasn’t a one-way street after all. Terror gripped us both. How were we going to get out? So here we are in the mountains. It’s spectacular. The site is beautiful. We walked back into town this morning to take pictures of the scene of our embarrassment yesterday and it involved walking two miles up a very steep hill and back down another one to get to the square. People here must be incredibly fit. With a full fridge and a bit of cash it sounds like Presa de Vinuela could be a semi-paradise, no wonder John doesn’t want you to let anyone else know! Thanks Jayne. We wouldn’t repeat that experience again in a hurry but we’ve found that most people are very helpful and will assist us when we get in a tight corner. that doesn’t count the Panda driver of course. Another fantastic read Ladies! I take my hat off to you both in your driving skills. Rookie mistakes are just cos you’ve gotten relaxed! And what a lovely way to be. Omg on the drive into the village. Any motorhomer has got that t shirt. Does this mean the alcohol consumption is nearly matching ours? Can’t believe how close we were to each other. Except we were doing the free way. See our next blog if I can tear myself away from relaxing! Probably tomorrow, OK tomorrow never comes but I will get a ROUND TUIT someday. We are in bird heaven at the moment just staring at Greater Flamingos, well that’s what the sign says. Tune into TheOldAgeTravellers.wordpress.com soon to find out.